I live five minutes drive from Sydney fish markets. As a seafood lover, I do visit the markets often. 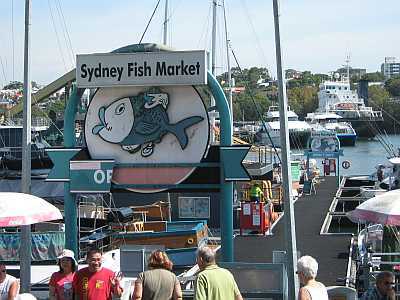 The market is located at Blackwattle Bay, near Anzac bridge, five minutes from Sydney CBD. The Fish Markets is Australia’s only working fishermen’s market, it begins at 5.30am when seafood buyers arrive to buy fresh catch of the day, there are about 50 tonnes of fresh catch auctioned early each morning. The markets have a variety of seafood retail shops, restaurants and shushi bars, bottle shops, cafes, bakeries and a fruit and vege shop. The market is busy during the week ,and extremely busy at weekends. The visitors are Sydneysiders and tourists. The markets are vibrant and colourful. From feng shui perspective, the fish market have ‘青龙，白虎’ — green dragon, white tiger formation. There are tall apartment buildings in the east side of the market, and a light rail bring visitors from the east, ferries and ships from the water in the west side of the market, wentworth park in the south also brings good energy. A good land form defines the good energy. However the landform of the market is not all perfect, there are problems in North, NE and SW directions. In particular, the restaurant upstairs doesn’t receive the positive energy properly, and often changes owners.